So, you’ve bought yourself an Arduino starter kit What’s Included In An Arduino Starter Kit? 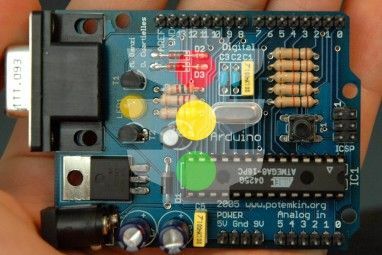 [MakeUseOf Explains] What’s Included In An Arduino Starter Kit? 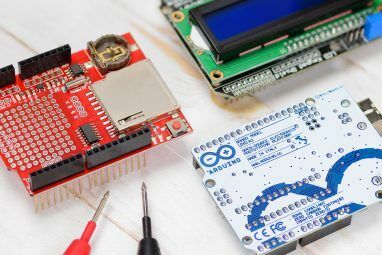 [MakeUseOf Explains] I have previously introduced the Arduino open-source hardware here on MakeUseOf, but you’re going need more than just the actual Arduino to build something out of it and actually get started. Arduino "starter kits" are... Read More , and possibly some other random cool components 8 More Cool Components For Your Arduino Projects 8 More Cool Components For Your Arduino Projects So, you're thinking about getting an Arduino starter kit, but wondering if some basic LEDs and resistors is going to be enough to keep you busy for the weekend? Probably not. Here are another 8... Read More – now what? 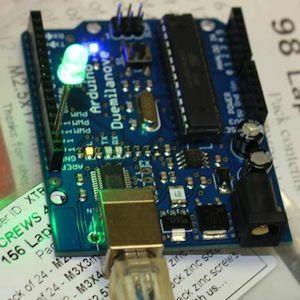 How do you actually get started with programming this Arduino thing What Is Arduino & What Can You Do With It? What Is Arduino & What Can You Do With It? 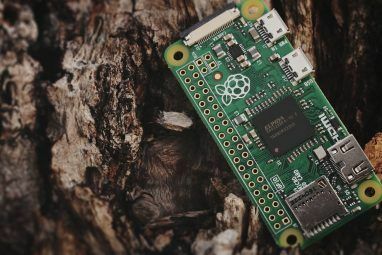 The Arduino is a remarkable little electronics device, but if you've never used one before, just what exactly are they, and what can you do with one? Read More ? How do you set it up and upload some code? Read on and I’ll explain all. I’m going to assume you have an Arduino Uno board, because that’s the one that comes with most Arduino starter kits. You have it easy on a Mac. Just download the latest Arduino package, mount it, then run the included FTDIUSBSerial Driver. When thats done, drag the application to your applications folder. You’ll need to restart though to get the new drivers to kick in. When you first plug in the Arduino, OSX will tell you it’s detected a new interface. Just click Network Preferences and hit Apply – there is no configuration to do there. Nothing is ever easy in Windows, especially when it involves drivers. Start by downloading the latest package and unzipping it, preserving the folder structure. It’s quite a large download – 85MB when I checked, fully expanding to 230MB, so it may take a while to download. Plug in the Arduino with the included USB cable. It may try to search for drivers, but fail. Just close down the wizard and open up the device manager. The quickest way to do this instead of trying to navigate Windows’ confusing set of Control Panel multilevel menus, is just to click start, and type in devmgmt.msc . Hit enter and you’ll open the device manager directly. Under Other Devices you should see an Arduino Uno listed, with one of those yellow “problem” marks. Double click, select Update Drivers, and choose Browse My Computer for Driver Software. Choose the options of Let Me Choose a Driver, click All Devices, Have Disk, and navigate to the download folder. In the drivers folder, you should see an Arduino Uno file. Choose that. The driver install process will recognise it as a “Communications Port”, and will cause an “unsigned driver error” to appear when you install. Ignore that, and install anyway. If you’re using XP, the process is a bit more involved and involves two sets of drivers. Read the full instruction set on the Arduino page. A matching board is chosen. The Uno is the default and was already selected on my installation, but it’s always good to check. The serial port is chosen correctly. On Windows, I found I only had one option (see the screenshot) and it was unselected, so the choice wasn’t difficult. On a Mac, the port names are a little more convoluted, but basically it’ll be in one of the two USB ports listed. cu-USB was the correct choice on my machine, but it may be different for you. Let’s take a quick look at the toolbar. – Play symbol: This compiles your code to check it without actually uploading it to the Arduino, but clicking the upload button will perform this too. – Stop symbol: This will stop the COMPILE of your program, not stop any running application already uploaded to the Arduino. – Up arrow: Open – loads an existing project. There’s hundreds of example programs included, but leave this for now. – Right arrow: Upload the current code to the Arduino. – Serial Monitor: This allows you to check communications coming from the Arduino when it’s connected to the computer, but don’t worry about it for now. To check your Arduino board is working and connected correctly, go ahead and click the Upload button. After a short moment compiling the app, some orange lights labelled TX / RX on the Arduino should start flashing. This means it’s transmitting or receiving something – in this case the code you are uploading. When the process is done, the code will be run immediately. This app is incredibly simple – it will just “blink” the on-board LED labelled L (while the board is plugged in, there will a green LED that stays on, this just indicates power and will not blink). You can use your own LED too if you like – just stick the longer of the two legs into the hole number 13, and the shorter leg (the LED should have a flat bit on the head on this side) into the neighbouring GND hole. The LEDs will both flash together now. That’s as far as we’ll go this time. You’ve now set up the Arduino and figured out how to upload apps to it, confirming that it works. That’s a good start, and at this point you might like to look over the Blink app code, and try to figure out what, or how it is doing it. Don’t worry if you don’t understand it yet, as I’ll explain the code in detail next time, as well as explaining the various bits on the Arduino board. Thanks for reading, and as ever we welcome comments. If you having problems getting the board set up, feel free to ask away in the comments, but if your question relates to an outdated version of Windows or some obscure Linux distro then it’s unlikely I’ll be able to help. Please people,,, what can arduino be used for. because i am asked to work on a project using arduino and i dont know what to do... please help me!!!! Hey please include explanation for Linux too. It is very unfortunate that even makeuseof ignores Linux users. Sorry, but I simply don't have enough words to cover every operating system, nor do I run linux. If an app or article I run is possible on both linux and windows, I try to cover both, but you can't possibly expect me to add a linux explanation for every single article. MakeUseOf does support linux users and always has with a steady stream of linux related content, written by authors who do run linux on a daily basis are equipped to deal with it. I am not, and I would not like to give the impression that I am. Please understand that if content is not categorised as for linux, it generally will not contain linux specific information. You are really making me want to get one of these.. Imagine the Halloween costume applications.. insane! I can't really think how you might use these in a halloween costume, but that's why you win those competitions and I dont!